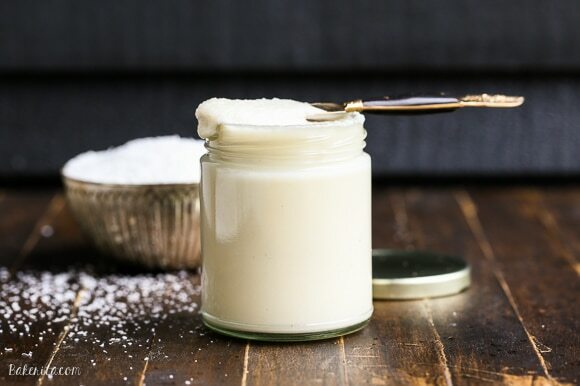 Homemade Coconut Butter has just one ingredient: coconut! It’s easy to make at home in a food processor or high-powdered blender and can be used in TONS of ways – it’s great as a spread on it’s own and can also be used in many different recipes. I’m almost embarrassed to post this because it can barely be called a recipe. Seriously…it has ONE ingredient. It’s less a recipe and more just a post full of me telling you why you should put some unsweetened coconut flakes in your blender or food processor. And I have a lot of good reasons. See, what happens when you blend up that unsweetened shredded or flaked coconut is that it slowly breaks down into a smooth, luscious coconut butter. 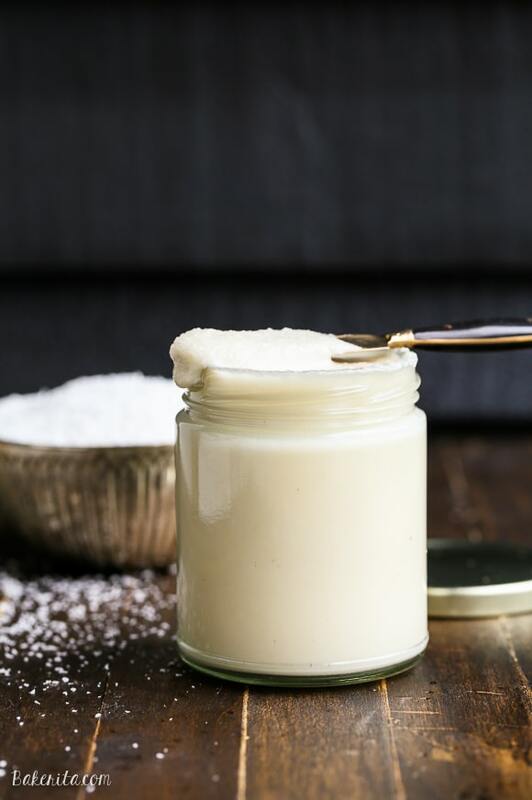 It’s similar to coconut oil in that it has a low 77º melting point, and when it’s all melty, it’s a fabulous spread on toast and perfect for drizzling over your bowl of oatmeal or yogurt. Coconut butter is also an amazing ingredient to be used in other delectable treats, like my Almond Joy Brownies and these Paleo Magic Cookie Bars – just to tease you a bit with the possibilities. Whip up a jar of the stuff, and I promise you’ll find lots of ways to use it up. The type of coconut that you use is important. I pretty much always use this unsweetened shredded coconut from Bob’s Red Mill – it’s super fine, high quality, and blends into coconut butter super quickly! You can also use unsweetened coconut flakes. Most pure unsweetened coconut should work, just be sure to avoid the stuff with sugar added. Now, let’s chat a bit about how to make it, and the differences based on whether you use a food processor or high powered blender. I personally use my Vitamix blender and it does the job in about 3 minutes, no problem. I would expect that other high powered blenders would perform similarly, but unfortunately, I don’t think a cheap-y blender would be strong enough to fully break the coconut down. In the blender, I like to use about 3 cups of unsweetened shredded coconut. I use the tamper stick to push the coconut down as it begins to break down, but eventually it will start to become pastey. Continue processing on medium-high and it will liquify. Once I see it start to liquify, I crank the speed to high and process for another 10 seconds or so to make sure it’s super smooth. That’s it! The process is pretty similar in a food processor, but it takes a little bit longer and you’ll have to stop the machine occasionally to scrape down the sides. In a food processor, I’d expect it to take about 8-10 minutes, compared to 3-5 in a high powered blender. When the coconut is smooth, liquid-y, and pourable, it’s ready! Happy coconut butter making, and enjoy! Place the unsweetened shredded coconut in a high-powered blender (I used my Vitamix) or a food processor. In a blender, anywhere between 2-4 cups of coconut will work. For a food processor, I find 4 cups works best. Turn the machine on high and process until a smooth butter forms. If you're using a high-powered blender, use the tamper stick to push the coconut flakes down towards the blades until the butter gets creamy enough to blend without it. It should take 3-5 minutes. If you're using a food processor, scrape down the sides frequently to ensure everything is evenly blended. It will take between 6-12 minutes in a food processor. Pour the mixture into a glass jar or container. The coconut butter will be solid if stored below 77ºF - heat for about 15 seconds in the microwave to re-liquify. This is not a sponsored post, but there are affiliate links. I seriously am shocked whenever I see how much they charge for it and cringe when I see bloggers recommend buying it when it’s SO cheap and easy to make! I had to share, since I make it once a week :) haha, thanks Sarah! So I’m embarrassed to admit that I don’t like coconut at all. However, I do like coconut oil (I know it’s not a strong flavor) but I would definitely try butter, too! I had no idea it was just one ingredient! Such a great idea, Rachel! 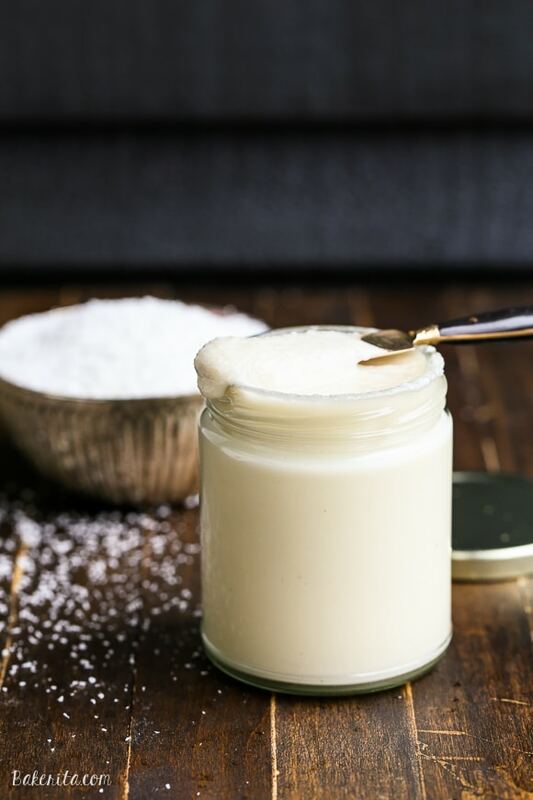 I can’t believe how easy it is to make your own coconut butter!! Thank you for this, Rachel. I have to try it!! THIS IS A GAME CHANGER! I had no idea it was so simple to make coconut butter! I looked at coconut butter last week and it was $11!!! I just couldn’t bring myself to do it! I am SO GLAD you posted this!!! Recipes that aren’t really recipes are the best, girlfriend! 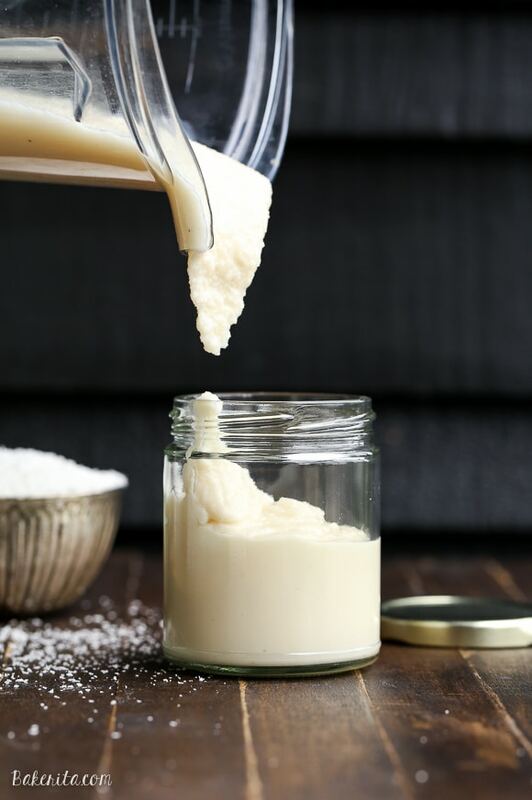 Especially when it’s something that can be used in all the things, like this Coconut Butter! LOVE it! Totally making this stat! Cheers, girlie! Can this be stored at room temp. or does it need to be refrigerated? And how long can it be stored? Hi Sue. Yes, it can be stored at room temperature, and that’s how I keep mine. It should last at least a few months, although I can’t say I’ve ever had it last that long! Don’t be embarrassed! This simplest are sometimes the best. I have to admit I had no clue that making coconut cream would be this easy. I’m going to try this for sure! Take care. This is BRILLIANT Rachel! Non recipes are the best kind of recipes I think! I have never made coconut butter. It looks so fun! And now my mind is flipping through all the awesome ways I can use it. I can’t wait to try this! So many great ways to use coconut butter! I keep meaning to try making coconut butter myself! I just usually buy it but I am a huge sucker for anything DIY when it comes to food!! 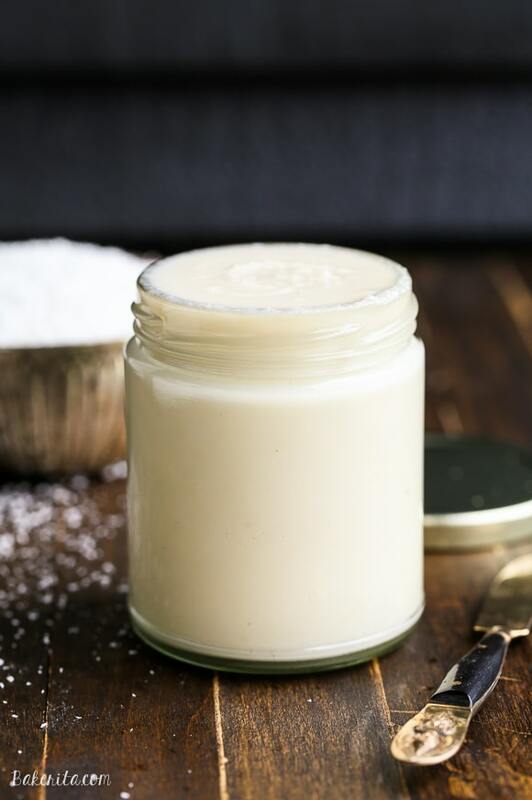 Coconut butter has many uses & benefits.We almost make coconut butter at home…It is pure,organic and healthy.I like this website which is really very informative.Thanks for sharing brilliant COCONUT BUTTER ideas. Hello,just want to say thank you for sharing this recipe. Have seen in stores but wasn’t sure what it was and deffinately to pricey for me. This stuff is oh so delicious,am glad I made it. There is also a really good coconut at natural grocer’s that i used in this,it is organic fine shredded coconut and it was very reasonably priced. If there is anyone out there who hasn’t tried this,well you deffinately should,especially if you are looking for a healthy,natural sweetened alternative. I haven’t been able to source fresh coconut so I haven’t tried it! Hey Rachel! Do I need to soak the shredded coconut in water first? Can this be used in soap recipes/soap making? No idea, I’ve never made soap before. I finally got it liquid and perfect and added honey at the very end and it seized up. Boo hoo hoo. What can I use to sweeten it? And when do I add it? Hi Leslie, I’ve never sweetened my coconut butter but all liquid sweeteners will make it seize, so I’d try coconut sugar. You could probably just blend it in with the coconut from the beginning, or add it towards the end while it’s blending. It shouldn’t make it seize since it’s not liquid. Sorry for your trouble! Any thoughts on toasting the coconut before processing it? I have another recipe for toasted coconut butter here – it’s so dang good!